ONE SHEET ORIGINAL MOVIE POSTER. LINEN BACKED READY FOR FRAMING. For Thousands of Vintage Movie Posters. If it has any minor defects like pin holes, creases, etc. And they are not mentioned above, they should be visible in the high resolution photo. This poster has been Linen Backed and is ready for framing. This is a vintage original poster from our archives. These can be very difficult to find in any condition! A long time can go by without one of these coming up for sale. You will have trouble finding a nicer one. Very minimal typical fold line touch up. We evaluate and grade our linen backed posters prior to linen backing / restoration. We do this because after a poster has been restored it can sometimes be very difficult to determine exactly what was done to it. Our restorers are world renowned and can make a poster look Near Mint and flawless even if it originally had several unsightly defects. You may be willing to take the risk to save a few dollars, but we are not. We use super strong hi-quality packaging materials including thick cardboard, masonite, and costly pvc plastic tubes. Please scroll to the bottom of this listing to see if we have made any changes or added any additional information. Please be advised that over 95% of all Original Movie Posters. Printed before the mid 1980's were issued FOLDED. This is NOT considered a defect. Vintage rolled posters do exist, however they are extremely rare. For example, if we say a one sheet poster is 27" x 41" its precise measurements may be closer to 26 3/4" x 40 7/8" (or something similar). This slight variance is quite common for all original movie posters. BEWARE OF "FAKE" MOVIE POSTERS! There are fakes, bootlegs, reprints, and reproductions of almost every popular movie poster. WE DO NOT SELL THESE AS ORIGINALS LIKE OTHERS DO! There are many unscrupulous dealers who successfully pass off these posters as originals. They have been doing it for years! These fakes are almost indistinguishable from originals, only experts can tell. Please note that if we hold your items for longer than 30 days they will NOT BE RETURNABLE. WE TAKE EXTRA SPECIAL CARE WHEN WE PACKAGE YOUR ITEMS. Folded posters are placed in a plastic bag or envelope and in between STRONG pieces of cardboard and taped together before being placed in the package. We guarantee that all posters we sell are graded and described accurately. Unless otherwise specified in the description, ALL POSTERS ARE ORIGINAL MOVIE POSTERS original theatrical movie posters that were displayed or meant for display (unused) in theaters at the time the movies were released. We will put in writing that we guarantee it to be an Original Movie Poster. 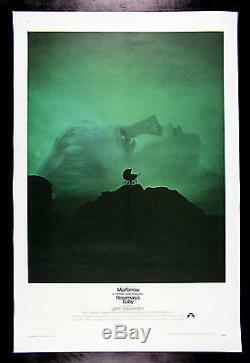 The item "ROSEMARY'S BABY CineMasterpieces ORIGINAL MOVIE POSTER MIA FARROW HORROR 1968" is in sale since Thursday, May 16, 2013. This item is in the category "Entertainment Memorabilia\Movie Memorabilia\Posters\Originals-United States\1960-69". The seller is "cinemasterpieces" and is located in Scottsdale, Arizona.